We feel very fortunate to find ourselves, ten and a half years after Aliyah, in a place filled with people with a love of Eretz Yisrael, Am Yisrael and Medinat Yisrael. We thank our family and friends for being here to celebrate as our cotton-ball carrying, thumb-sucking, chubby-cheeked Yehuda takes his place among his people. We thank all of our dear family and friends for their friendship, support, love and for serving as such wonderful role models both for us and for our kids. A few stand out for special thanks. Rav Matanya, for the love and caring that you show to the children of Neve Daniel. We have laughed for years as our boys argue about whose Rav you are and we try to explain that you are the Rav of ALL the children. To Yehuda’s hevruta, Rav Pinchas Langer…how amazing it is for us to have someone willing to spend part of his Shabbat afternoons to learn with Yehuda every week. Rav Eldad Zamir who prepared Yehuda for his bar mitzvah, but more importantly, has served as a wonderful role model for our boys over the years. Netanel Kasovitz for learning Yehuda’s parsha with him and for being a great model of enthusiasm in everything that you do. We also want to say thank you to our families for schlepping, quite literally, around the world to be here with us and for all you do! And we are sorry that Papa Rogie and Uncle Gary got stuck in New York and aren’t with us here today. We miss you. Thank you as well, of course, to Josh for bringing us to this day, in this place, and for always being there for the boys and for me. Last, and certainly not least, we want to thank HaKadosh Baruch-hu for bringing us to this day…Shechiyanu V’Kiyamanu v’Higiyanu lazman ha’zeh. In December of 2001, we had a few bachurim from Israel who were part of the Torah Mitzion Kollel in Washington at our house for Shabbat dinner. We were in the midst of trying to figure out names for our second child. We grilled them about Israeli names and had a great time asking them what they thought about this name and that. None of the names resonated particularly with us – but one of the boys was named Yehuda. And his respect, love of Israel and dignity resonated. Ironically, on the cusp of Yehuda’s bar mitzvah 13 years later, we ran into one of these bachurim when we realized that he was our dentist in Beitar – and that he lives in Neve Daniel. What an experience that was – who could have imagined as we were playing around with names in Potomac, Maryland 13 years ago that we would meet up with one of those boys again in the dentist’s chair. Then, the following week, Daddy came home from shul with a twinkle in his eye. “I found it,” he said. “The name. I’ve got it.” We had guests for lunch so he didn’t get a chance to tell me what it was that he had found, and I was burning with curiosity all through lunch. When our guests left he explained that it was parsha Vayigash and that while he was reading the parsha in shul, he realized that we had found our son’s name. In this parsha, one of the brothers stepped forward to confront the all-powerful Egyptian ruler, who he did not yet know was his brother Yosef, to beg for Binyamin’s safety and return to their father. His words were simple yet eloquent; controlled yet emotional; respectful yet firm. What perfect traits! He refused to return to their father without his brother and he stood there waiting for Yosef to agree. As we all know, this bold man’s name was Yehuda. It amazes me how you can give an unborn child a name, how you can have an idea in your head of what your child should be, and find that he perfectly fits the bill. When explaining your name at your brit, Daddy quoted the same line that I just mentioned above. We hoped then, EXACTLY 13 years ago today, that you would one day live up to those lofty expectations. We are thrilled to see that you are well on your way! Because you are, indeed, Yehuda. You are one of many brothers, and yet you are always the one looking out for the others. In Parsha Vayetze, the parsha when your namesake is born, there is an explanation of the name Yehuda. When Leah names her fourth son “Yehuda” she explains that it means (haapa’am odeh et Hashem) “This time I will thank Gd.” Interestingly, Rabbi Shimon Bar Yochai comments about this naming. He says that, since the day that Gd created the world, no one thanked Him until Leah came and did so. Could it be that no one had yet thanked Gd? What he meant by this was that Leah, through the bitterness and difficulties of her life, was able to see the beauty and joy with her son’s birth – she was able to appreciate the good in every situation, and the name Yehuda embodies this type of gratitude. And no one in the Torah, had shown this layered understanding of gratitude towards Hashem. In your parsha, Terumah, which you read so beautifully yesterday, there is a focus on Gd’s instructions to Moshe Rabbenu about building the Mishkan and all of the ritual objects that it contains. At the beginning of the parsha every person is called on to donate his possessions. The language here is quite interesting as it says that Moshe should “speak unto the children of Israel that they take for Me an offering.” Normally, we would say that they should GIVE to me an offering – rather than TAKE FOR ME. The people are being asked to give and not to take. So why this choice of words? This language is beautifully fitting for your personality, Yehuda, as it shows that the act of giving really enables the one who gives to take. The Torah is showing us that when you give – you really get. Your life becomes richer through your act of giving whether you are giving to Hashem, your community, your family, your friends or your school. If you think about it, as well, Hashem doesn’t really need us to bring all of our objects to build the Mishkan. He really is perfectly capable of building it himself. So why the list, over and over again, of what we should bring? Because by being part of something larger than yourself – by giving of yourself to your community and to Hashem – you help to build something special and you truly get in return. And this is the message of your parsha. And we see this, Yehuda, in you already. In the ways that you give. You’ve run in the Jerusalem marathon for Shalva, raising thousands of shekels to help children with special needs. You worked hard to raise money for Sharei Tzedek hospital when Stella was sick. You and your brothers regularly collect food on behalf of Yad Eliezer. 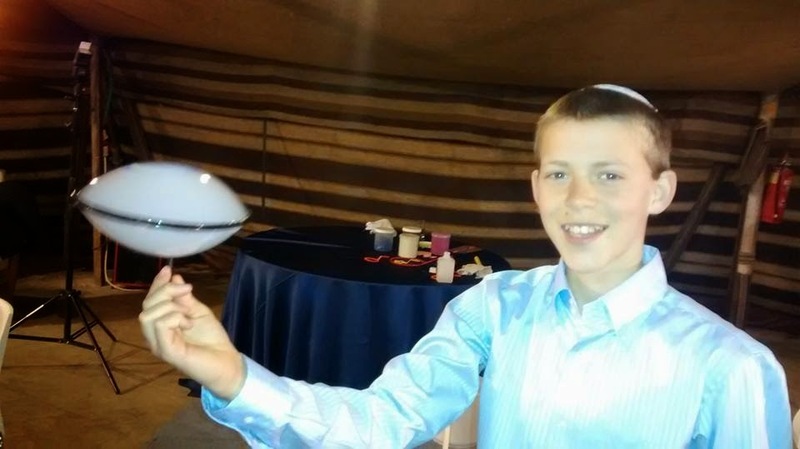 And with your bar mitzvah money, we’ve discussed ways that you plan to give of it, including being part of the Sefer Torah that the Sivans are having written in memory of your dear friend, Chanan. We certainly hope that you will remember to give of yourself always – your time, your money, your energy – to the things that are important to you and to Israel. As we started to talk about the painting that you would create for your invitation, I mentioned to you that the parsha is overflowing with color. It says over and over again that the people should bring gold, silver and copper. That they should come with blue, purple and crimson yarns. I love how alive and vibrant the parsha is through its descriptions. It is bursting with anticipation, with an explosion of colors, with promise. And you certainly captured this beautifully in the painting that you made for your invitation and your bencher. Our wish to you, dear beautiful Yehuda, is that you should paint your life with these colors. That every moment should be captured with blue, purple and crimson and that you should light up the world with the colors that express your neshama as you continue to grow into the special man you are becoming each and every day. You are a light to us. A light of vibrancy, color, energy and depth of character. May you show that vibrancy to the world in hues of blue, purple, crimson, gold, silver and copper as you continue to become the amazing Yehuda that we know you will be.